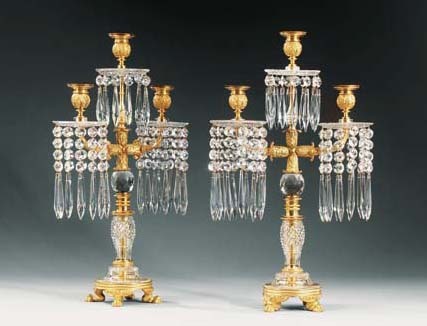 These glass lights, conceived in the manner of Roman candelabra popularised by G.B. Piranesi's engravings, are ormolu-enriched in the early 19th Century French fashion. With their tazza-supported 'krater' vases, acanthus-budded pillars, and drum-plinths with bacchic lion-paw feet, they reflect the antique style promoted by Thomas Hope's Household Furniture and Interior Decoration, 1807. A related 'girandole' manufactured by Messrs Pellatt and Green of St Paul's Churchyard was illustrated and described as 'peculiarly elegant' in the 1821 edition of R. Ackermann's Repository of Arts, and others executed by the Ludgate Hill glass-manufacturer John Blades, feature in the illustration of his 'Upper Show Room' published in 1823 (see back cover illustration of Country House Lighting, Temple Newsam House Studies no. 4, Leeds, 1992).